Since its beginning in 1964, Kramer's has become one of the most knowledgeable, professional and safest towing and recovery companies around. LeRoy and Arlene Kramer started the business Kramer's Wrecker Service in 1964. In 2001, son in-law and daughter Tim and Lisa Bartz bought the company and took the reins of the family business. The company stated small and was built through hard work, integrity and values passed along from generation to generation. We buy, sell and recycle any automobile or truck and handle scrap metal, copper, brass, aluminum and iron at Kramer's Auto Parts and Iron Company. We're a computerized nationwide parts locating service. Even more, we offer 24-hour roadside assistance and towing. 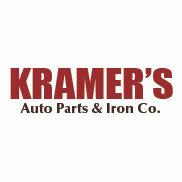 At Kramer's Auto Parts & Iron Company, we know cars. We buy, sell and recycle autos, trucks, copper, brass, aluminum and iron, and we provide a loading dock and are fully insured. We also offer free, computerized nationwide parts locating and daily shipping. Kramer's is here to help you any time day or night with 24-hour road service. Our motto is "If It Rolls, Floats, or Flies, We'll Tow It!" We can handle any transportation service with our equipment. Our fleet consists of: 3 semi wreckers, 1 medium duty wrecker, 1 auto loader, 5 flatbed tow trucks, Landoll 440 Trailer, Landoll 855 Detach and all equipment for load transfers, semi-trucks and trailers. We also provide tire changes, jump starts, load shifts, private property towing, abandoned vehicle recovery, air bag recovery, roadside assistance, service calls, heavy equipment recovery, winch outs and any other towing service.